I was swept in an idyllic jungle adventure fantasy as our houseboat meandered up the majestic Sekonyer. All my senses were assaulted by the raw untouched environment as we witnessed the occasional kingfisher swoop down in front of the boat, the playful macaques frolicking in the branches above and the elusive orangutans nestled high in the old growth trees. The journey into the rainforest was a brief glimpse of what existed before the arrival of man, but the fantasy quickly faded as the direness of the situation unfolded before me. 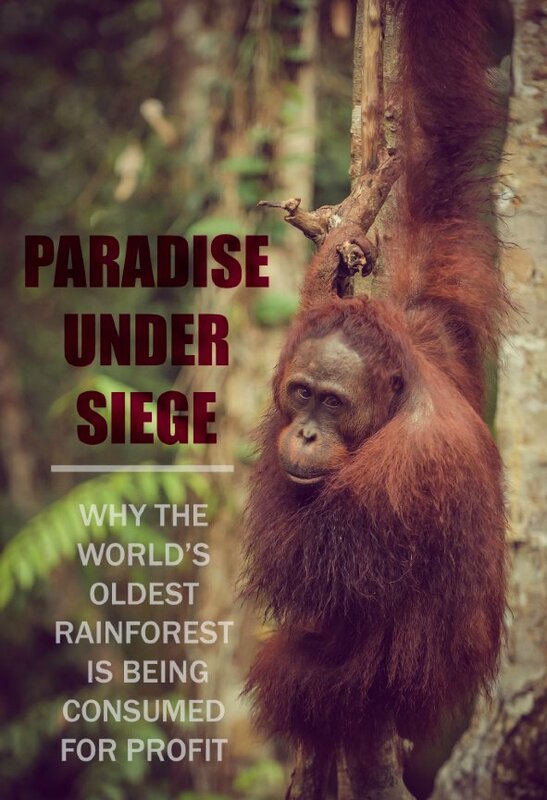 Surrounding the magical paradise of Tanjung Puting National park (TPNP) is a critical threat that besieges the 130 million year old tropical rainforest. The rapid industrialization of Indonesia is leading them down the dirty path of deforestation that many developped countries are too late to return from. With the statistics of the present and wisdom of the past at our fingertips it is painful to see an evolving nation make the same irreparable mistakes. During my experience visiting TPNP I was inspired by the efforts of The Orangutan Foundation International (OFI) to rehabilitate captured orangutans into the wild and protect the national park, but it dawned on me the truth that unless we see an end to the reckless deforestation, in 10-20 years there will no longer be a wild Borneo for these orangutans to return to. The island of Borneo is the third largest island in the world after Green land and New Guinea boasting 743,330 km2. The islands surface was once mostly covered in presumably the oldest tropical rainforest in the world. The biodiversity of this rainforest is off the charts: housing 15,000 species of flowering plants, 3,000 species of trees, 221 species of mammals (44 endemic to Borneo) and 420 species of resident birds. 772 Indonesian species are threatened or endangered, giving Indonesia the third highest number of threatened species of any country in the world. What’s remaining of the current rainforest is shocking. The latest joint research done by 3 Universities utilizing satellite imaging has found that 80% of the tropical forest in Borneo has been degraded. The main causes destroying this rainforest are logging, agricultural land clearing for crops such as palm plantations, and forest fires. It was reported in 2000 by the Indonesia-United Kingdom Tropical Forest Management Program that 73% of logging done in Indonesia was illegal. In 2001, 99 million acres (larger than the area of Germany) of Indonesian forest had been lost within the previous 32 years. The annual value of illegal timber taken from TPNP alone was estimated at $8 million. The global demand for hardwood is making it quick cash for chopping down large old growth hardwood. Even if you haven’t heard of palm oil, chances are you are already consuming or using it everyday. Palm oil is used in many everyday products such as chocolate, Nutella, chewing gum, soap, lipstick, washing powder and even in bio diesel fuel. As an oil, it actually does have its benefits as it stays semi solid at room temperature but does not have the trans fats found in hydrogenated oils. It is used often in foods that require a longer shelf life such as biscuits and crackers. From an agricultural standpoint, it has amazing yield producing 3.6 tonnes an hectare compared to half a tonne with soy; it is no wonder why more uses for such a rewarding product have been emerging. Palm oil is currently the worlds most profitable edible vegetable oil, making up over 40% of the market.The increasing global demand combined with cheap land, inexpensive labour, eager investors, short growth cycle, and lack of environmental control makes the palm industry one of the biggest threats to the Bornean rainforest. 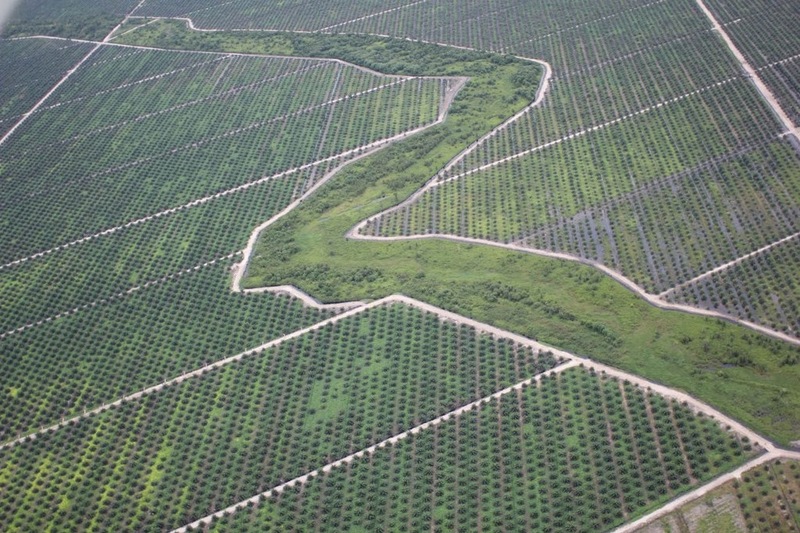 Indonesia is the world largest producer and consumer of palm oil. Production has increased from 157 000 tonnes in 1964 to 31 million tonnes in 2013. When we flew from Pangkalanbun in southern Borneo to Ketapang in north western Borneo we witnessed firsthand the destruction of rainforest. The landscape started as lush old growth rainforest but as we flew on it was scarred with vast plots of uniform plotted palm plantations. Some of the palm fields seemed to stretch forever in the desolate uninhabited and unreachable areas. Indonesia projects to increase production to support global demand to 40 million tonnes by 2020. It is evident that even more land will have to be cleared to meet these outrageous numbers. In 1997 a series of disastrous forest fires devastated over 6 million acres of the rainforest in Borneo. 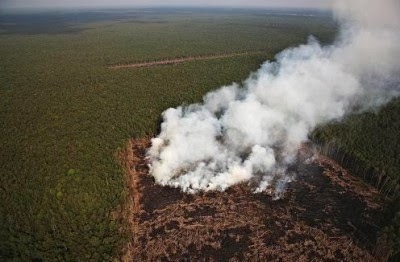 The Indonesian government blames this event on local agriculturalists for the fires, however the World Wildlife Foundation (WWF) proved through satellite imaging that in fact these fires were mainly started by large commercial operations to clear land for agricultural development. Today fires are used annually to clear agricultural and degraded forest lands but the danger of it spreading to nearby forests are always a threat. The lack of regulations and enforcement for dangerous land clearing is a huge problem menacing the rainforest. It is all too easy to point fingers at the Indonesian government for selling out their rainforest, but that would be hypocritical and naive. With most of the european countries already long through their industrial childhood and long parted from their natural forests it is safe to say they would’t be where they are today without exploiting their natural resources as they did. In North America the messy extraction of tar sands endangering the wildlife of the north is also repeating the same story. We cannot rely on the government or the industry to stop deforestation without public pressure and it is up to the people who care like you and me to initialize creative solutions. 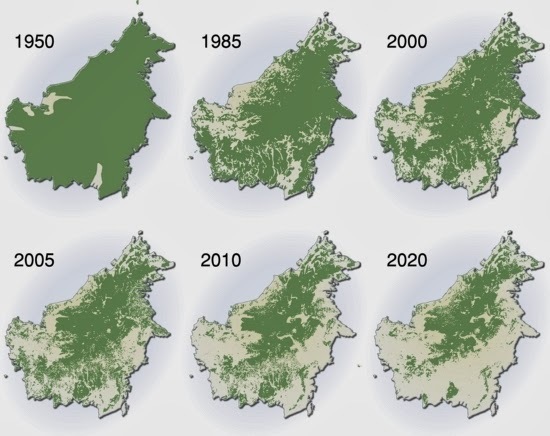 It is obvious that without intervention outside Borneo, the rainforest will not survive. So where do we start? Several Organizations such as OFI and the World Wildlife Foundation have already been implementing plans to save the rainforest. OFI not only helps protect and sustain existing national park land but has started a forest legacy program to buy and expand protected park land before it is bought and exploited by commercial ventures. 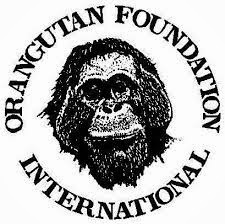 In 2006 WWF orchestrated a joint effort from the 3 countries that share the island of Borneo. 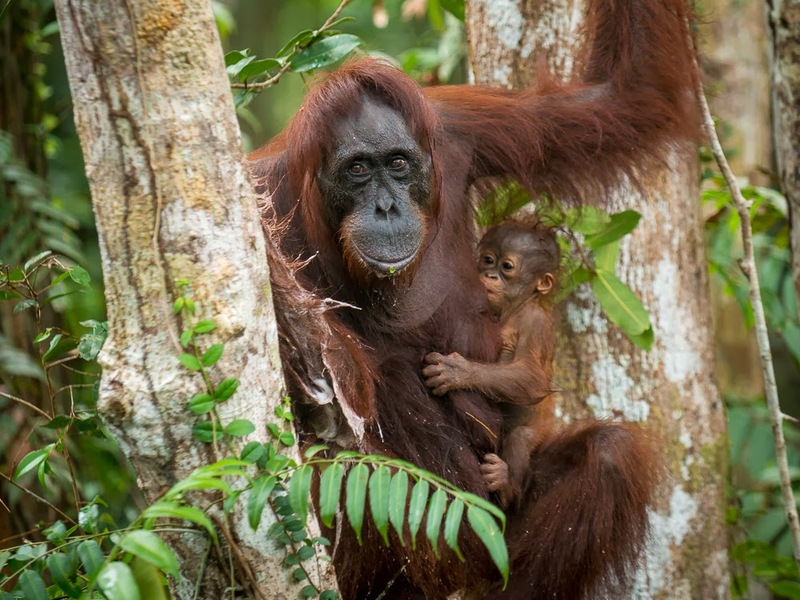 In this initiative called “the heart of Borneo” Malaysia declared it would protect 200 000 acres of rainforest, Brunei established 2 conservation areas, and Indonesia proposed a new national park. The new park in Indonesia was proposed back in 2006, but there have been no reports about it since. Campaigns for organizations such as these are essential for raising global awareness and to but international pressure on local governments to protect their forests. Taking things into our own hands we can empower ourselves by being smart consumers and hit the industry where it hurts. The Round Table of Sustainable Palm Oil was established in 2004 to promote the production and use of sustainable palm oil for the world. Approved growers gain the label of compliance to regulations, commitment to transparency, environmental responsibility and conservation of bio-diverse resources, and use of best practices. 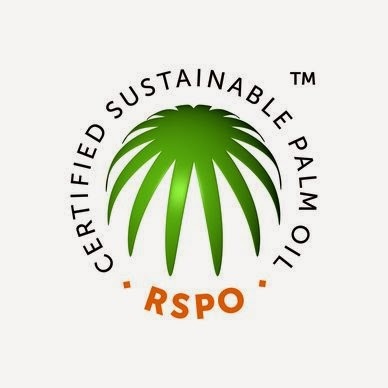 Today only 14% of the worlds palm oil is certified by RSPO. We can increase these numbers by only buying palm oil products with the RSPO seal. Perhaps its time for a new wave of creative minds to step in and fire up the buzz. I invite you all to inform yourselves with knowledge of the situation in Borneo and spread the word. The first step to helping is understanding the problem. Organizations like OFI have already paved the way for change, now it is up to the masses to support the cause and put the pressure on the entities responsable. The existance of orangutangs and tropical rainforests now lie delicately in the palm of our hands. To read my personal account of the journey and more photos check out my post : "Looking into the eyes of an orangutan"